President Obama and his family will return to Martha’s Vineyard Saturday for a weeklong vacation, his fourth trip to the Island during his time in office. The president and first lady will arrive in Air Force One at Cape Cod Coast Guard Air Station and then travel by helicopter to the Vineyard. The arrival time is not being released, but it is expected to be later in the day on Saturday. According to the White House, Mr. Obama will be on the Island until Sunday, August 18. There are no public events scheduled during his trip. 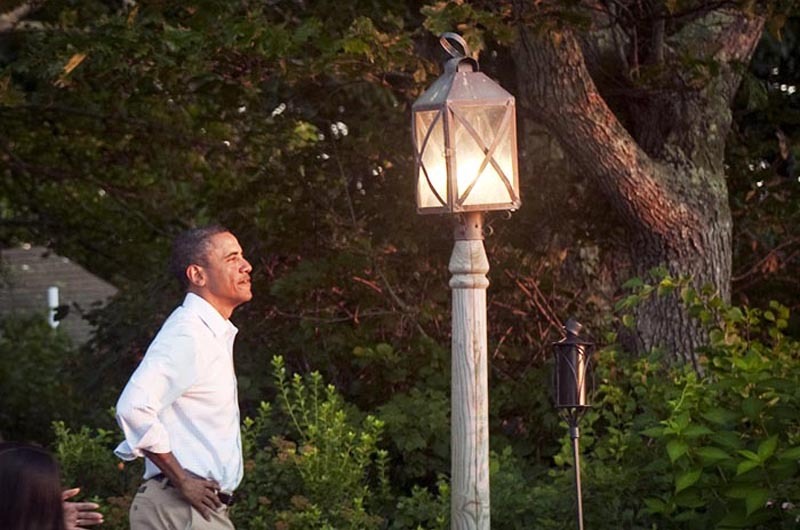 The Obamas will be staying at a private home on Snail Road in Chilmark. The home is owned by David Schulte, a summer resident from Chicago who does not normally rent his property. Though Mr. Schulte knows the president, he has not had any contact with the White House on the rental. It is understood that Mr. Schulte was approached by Tom Wallace of Wallace and Co. Sotheby’s International about renting to the first family. Mr. Wallace has handled presidential rentals in the past. Built in 1961 and renovated about 10 years ago, the 5,000-square-foot contemporary-style home sits on a ridge overlooking Chilmark Pond and the Atlantic Ocean. The nine and a half-acre property has access to Chilmark Pond. The house has a private master suite with its own den, porch, outdoor shower, access to a gymnasium and his and her bathrooms. An open floor plan includes pond and ocean views from the living room, dining room and kitchen. An outside patio and screened dining room overlook an infinity pool. There are three guest bedrooms with baths. Additional amenities include a small basketball court and guest house. During Mr. Obama’s three previous visits in 2009, 2010 and 2011, he stayed at Blue Heron Farm, a 28-acre estate overlooking Tisbury Great Pond. The estate was sold in late 2011 to Lord Norman and Lady Elena Foster, who chose not to rent out the property. Mr. Obama did not visit in 2012, when he was in the middle of an election race. While preparations have been under way for months behind the scenes, there has been a flurry of preparatory activity on the Island this week, with military helicopters including a U.S. Marine Corps Bell-Boeing V-22 Osprey aircraft seen in the skies, shiny red Coast Guard helicopters at the airport and large, black Secret Service vans with government plates around the Island. Chilmark executive secretary Tim Carroll said two Verizon cell-on-wheels mobile sites, or “cows,” were expected to arrive in Chilmark to improve cellular service during the president’s stay. The Secret Service has been in evidence all around the Island this week. Peter Martell, owner of the Wesley Hotel in Oak Bluffs, said he has 70 rooms booked for Secret Service members and five reserved for the Transportation Security Agency (TSA). Part of one of Chilmark’s main roads will be closed during the presidential visit. Chilmark police said this week that South Road will be closed between Meeting House Road and Wooton Bassett Road. The road closures will start at 2 p.m. on Saturday and will not affect the annual Chilmark Road Race Saturday morning on Middle Road. Blinking signs are in place warning residents about the road closures. Chilmark police said residents will be able to get through after showing identification and being swept by security. The road closure sparked some grumbling this week, including among the Chilmark selectmen. “I’m very pleased that the chief has cooperated so well with the Secret Service and that we’ve worked together each year, but it could be an inconvenience this year,” Mr. Doty said. Temporary air space restrictions are in place around the Martha’s Vineyard Airport for the duration of Mr. Obama’s trip, airport manager Sean Flynn said. Airplanes will be restricted in a 30-mile perimeter around the airport, with further restrictions for a 10-mile perimeter. Commercial flights will not be affected. The Katama Airpark will be generally closed to all airplanes coming in and out, manager and pilot Mike Creato said. The red biplane run by Classic Aviation gets to fly, but on a restricted basis, he said. “You know, it’s a short busy season, it’s August,” he said about the timing of the closure, but he also noted it is part of protocol. “It’s just the way things are after 9/11 . . . pretty typical,” Mr. Creato said. Mr. Obama and his family have ties to the Island that predate his presidency. Harvard professor Henry Louis (Skip) Gates Jr., an annual visitor, held a fundraiser on the Vineyard for Mr. Obama when he was still a senator. And Mr. Obama’s senior advisor Valerie Jarrett is a longtime Oak Bluffs summer visitor. With his visits, Mr. Obama follows a long tradition of sitting presidents visiting the Vineyard, including Ulysses S. Grant and Bill Clinton. Mr. Clinton was highly visible when he visited the Island during all but one of the years he was president. Mr. Obama keeps a lower profile. During their previous visits, the Obamas have dined at an array of Island restaurants. Mr. Obama usually plays lots of golf, and in the past the family has gone to the Bunch of Grapes bookstore in Vineyard Haven to stock up on beach reads. The first dog, Bo, a purebred Portuguese water dog, usually travels with the family. Their last visit, in 2011, was cut a day short by Hurricane Irene. The weekend forecast calls for a chance of showers early Saturday, then clearing with sunny skies and temperatures between 73 and 79 degrees through the weekend. Remy Tumin contributed to this story. "GOD", please make it rain actually down pour each and every day between Saturday, August 10 Thu Sunday, August 18 so the Obama's can have some very quite and private alone time together! I hope they have a great visit but PLEASE it does NOT have to pour rain each day and dissrupt all the events taking place during their visit. Yes tthey need some quiet alone time......I doubt seriously that the 100 million dollar African trip we the taxpayers paid for didnt give your royal highnesses enough time, with all the secret service and staff. Give me a break!!!! You all need to wake up. 17 trillion in debt, millions out of work and they take vacations every month. That 100 million could have done a lot.....oh well, it isn' t their money! Please every president in history has taken vacations, which is wee deserved. It's now an iss with this president. Good morning President Obama & First Lady Obama & family and favourite dog bo, plus staff of the white house. I think you will have a very good time there, what a lovely place to spend it, there with the family. Drop by our house, Mr. President. We would like to thank you for a healthcare program that takes away our post-cancer fears, getting us out of two wars, expanding the freedom to marry, reducing unemployment, championing the middle class, fighting for reasonable gun laws, immigration reform, and an increased minimum wage. I agree with what John Williams said! To reference a previous administration, this actually is a "kinder, gentler nation." Nicely said, John. May he have 9 days of relative peace; he has surely earned it. I heard on NPR this a.m. that President Obama has taken exactly 87 days of vacation since he first took office in January of 2009. That's less than 3 weeks total per year. By contrast, Little-George Bush had taken 399 days in the same 4 yrs 7 months. Need one say more? No Joke. I take more vaca on the island than he does. Well deserved! Mr. President and family, I wish you a very recuperative and fun vacation with your family. While the White House is certainly a beautiful residence to live, you are clearly restricted. On the Vineyard, you can go anywhere you would like and enjoy the best the island has to offer. I will be moving to the Vineyard in the fall, and I feel so blessed and lucky to be able to do so. You could go anywhere on vacation, and you chose this wonderful place. For me, it is truly the most special place on Earth. I agree Patty, the best darn place on earth for a vacation. Just got back last week will go again in September. I hope the President and his family have a grand time. Just glad I won't be up there this coming week. (smile). While on the island, please tune into mvyradio.com. It's the best darn station on the planet. Perhaps you will even become a friend of MVY or better yet, stop by the station for a visit. Haha, nicely done! MVY is simply the best out there. Dear President Obama & Fam. I grew up on the Vineyard and have a book out called "Back-in-the-Day. If you visit Bunch of Grapes Bookstore in VH. I beleive they still have copies on the shelf in the Island Author's Section. You won't be disappointed. Yours in the struggle, Ralph. YOUR NOT SERIOUS RALPHIE!!!!!.......... "Yours in the struggle, Ralph." John, is that facetious? He's expanded violence and conflict and increased effective unemployment, especially amongst young people. I could keep on going with other problem areas but I think if you look up the effective unemployment rate, Obama's drone wars, NSA programs, etc, you may be a bit more knowledgeable/critical of his tenure. Please let me know if I could provide you or anyone else with some resources that may un-cloud your vision on his presidency/state of the union. The Obama's should go to camp David and save the taxpayers money!! And not intrude on property owners and visitors to the vineyard. Airport restrictions etc. Clearly he is in touch with the average American!! First off, the president is free to vacation where and when he wants. John Williams from W. Tisbury speaks for the true Left in this country, the Kool-Aid drinking crowd who voted in this guy. Obama has been a disaster from the start and will break this country if he can. Obamacare is govt. at its worst. And it will be enforced by the IRS, yes, the same corrupt IRS that has targeted political opponents of the president. Benghazi continues to fester while his "lead from behind" foreign policy has helped trigger chaos in the Middle East. 77% of new jobs during the phony recovery are part time. 6.6 million have given up looking for work and are not counted in govt. statistics any more (think Atlas Shrugged). Detroit's failure is just the first of many that shows what happens when Democrats run everything. Obama got involved in the Zimmerman case while over 200 young people have been murdered so far this year in Chicago. No, this president is worse than Jimmy Carter. A divider and a conquerer of the worst kind. It will take a generation to eradicate his "hope and change." God help us. Peter, really!! Get a grip. God is helping us by providing us with this man, who is so true and hopeful for this country. Obama and his wife have spent more of the taxpayers money on vacations than all the previous presidents combined. Oh, and same goes for government spending. Enjoy your golfing! Truth be told, this president has run up more debt in four years than every president before him. Hope for change! Please do not wish for rain; I always vacation when the President is on-island and I want sun. After all, this is MY vacation too! Mr. President and family (including the "First Pooch") ... Enjoy your vacation on the island. I sure have! You couldn't have picked a better place. And never mind the naysayers on here. They'll get over it! (P.S. Have someone go to Back Door Donuts after 7:30PM. They are fresh and warm and the best donuts you will EVER have!) God bless you and the First Family. I am so glad the Obamas will be vacationing on Marthas Vineyard. They were missed last year. It is a great boost to the economy around here. My husband and I are going to try and get over to the Vineyard while they are here next week since we live so close. Why do the Obama lovers and liberals always have to compare what he does to Bush? Do you all assume that if one dislikes Obama they must love Bush? Get over it, that guys been gone for 5+ years! What's the deal? Another vacation? When's he going to do some work? Wow, two losers in a row. We're really screwed. People and their stupid vacations. Get to work. I am reading through these comments and relize most of these people must be well to do democrats. You know, the ones that don't get targeted by the government. They wear their rose colored glasses and remain blind to the world. The rest of us have to deal with reality. A president that will spend us into oblivion, a huge unemployment rate and he wants the illegals to get amnesty, class warfare, race warfare, IRS scandal, Bengazi, 17 trillion in debt, a justice department that knows nothing of justice, NSA spyong on us. Oh yes, he gave us hope and change alright. I just hope we live through his change so we can take or country back. If the founding fathers could have seen what we have become....I am positive they would have let the british keep it! Shame on you all! President Obama fiddles while the American dollar shrinks and debt keeps growing and growing. Is this what you call Sequestration?